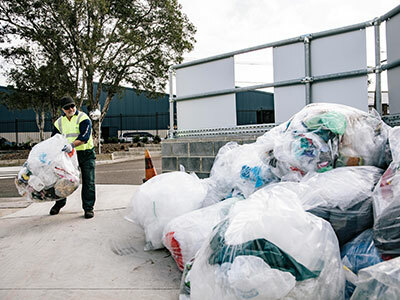 Randwick City Council has recently installed plastic bag and soft plastics recycling bins at the Randwick Recycling Centre, located at 72 Perry Street, Matraville. Plastic bags and soft plastic packaging cannot be recycled through the kerbside yellow lid recycling bins and need to be separated for specialist recycling. Did you know? Randwick City Council has collected over 300 kilograms of plastic bags and soft plastic packaging since this recycling service began in December 2013. This equates to over 90,000 soft plastic items saved from entering our marine and coastal environments, and from being sent to landfill! What happens to the soft plastics once they're collected? Soft plastics and plastic bags collected at the Randwick Recycling Centre are picked up by our service provider, RED Group. These items are then transported for recycling into new products such as sturdy outdoor furniture and signage.